Gobodo-Madikizela, a clinical psychologist, wrote A Human Being Died That Night: Forgiving Apartheid’s Chief Killer after several interviews with Eugene de Kock, the former commander of South Africa’s death squads during the apartheid era, imprisoned in 1996 for crimes against humanity. Her original task was to consult the Truth and Reconciliation Commission (TRC), the body established by Nelson Mandela following the demise of apartheid, but so fascinated was she by her encounters with the man known as ‘Prime Evil’ that she decided to write about him in relation to the seismic changes her country was experiencing. Her book has been described by Mandela as being “about the possibility of healing and restoration”. It’s an exploration of man’s ability to commit evil and compensate for wrongdoing; it’s neither a condemnation, nor an apology. Written from the first person, its objectivity is never compromised and, though written in plain English, it doesn’t lack academic authority. What draws Gobodo-Madikizela to de Kock is how ordinary he is, how he responds to her questions, and how he reflects on his responsibility for so many ruined lives. She’s intrigued by de Kock’s request to meet the widows of men he has killed, and even more by the women’s acceptance of the invitation and their admission that they embraced him. This, Gobodo-Madikizela explains, is what forced her to question everything she had originally assumed about remorse and forgiveness, and led to her initial meeting with de Kock at Pretoria Central Prison. The account between the two is remarkable, and one can feel the acute struggle that Gobodo-Madkikizela experiences when deciding how to consider her interviewee: a convicted mass murderer, undeserving of sympathy, or a human being who was born into an environment of hatred and did what was expected of him. She recalls the nationwide celebration when sentence was passed, and the caricature of de Kock as a cunning, manipulative monster. Gobodo-Madikizela has written a book aimed not only at those who lived through apartheid but also for those who didn’t. The book may be uncomfortable for those already convinced that de Kock is the caricature that he was portrayed as. Gobodo-Madikizela presents him as an almost courteous man who apologised for not shaving prior to her arrival, and makes references to the atrocities committed by the ANC and the relative ease with which de Kock was able to recruit its members as informants. She tells of an encounter with a woman who left a hearing of the TRC early and later told the story of her son’s murder – in doing so portraying the antagonism she and other TRC members faced in provincial communities for forcing them to relive the past. She’s demonstrated to non-South Africans that forgiveness can, for the individual, be a tool of empowerment, but for a society such as South Africa’s it’s a practical necessity when one lives amongst one’s former oppressors. 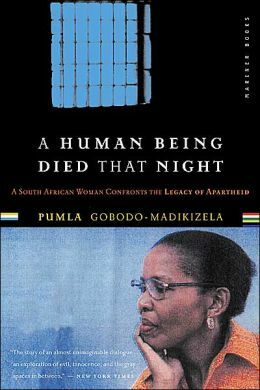 A Human Being Died That Night by Pumla Gobodo-Madikizela, published by Portobello Books. £8.99 from Amazon, Waterstones and others.